On a bright Sunday morning, Don Han was in South Orange County staring at a garage door covered in swastikas. Same for the Buick, parked in front of the house. The family that lived there was Jewish. The grandmother was a survivor of the Holocaust, when more than six million Jews were killed by the Nazis. As a 17-year veteran at OC Human Relations, one of Han’s main job duties is to respond to hate crimes and hate incidents in Orange County. In such situations, the 47-year-old Santa Ana resident is essentially a first responder to hate. Han brought his wife, Martha, along. Together, they drove to the nearest Home Depot and bought tarps to cover the Buick. They waited with the family until police responded. Leading up to the 2016 elections and afterward, Han says, it’s been busy as political rhetoric soaked in vitriol continues to widen the chasm between communities. While the South Orange County family was appreciative that Han was present, typically, they don’t keep in touch. It’s often too hard for families to revisit the incident, he says. Han has a strong sense of justice and compassion, two competing virtues that go hand in hand, said Rabbi Richard Steinberg, who leads Congregation Shir-Ha-Ma’alot in Irvine and chairs the county’s Human Relations Commission. 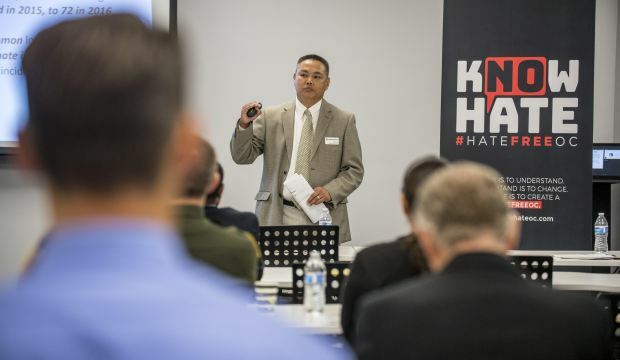 In addition to responding to hate crimes, Han also writes the Orange County Hate Crimes Report released jointly by the county’s Human Relations Commission and OC Human Relations, the commission’s nonprofit partner. He says hate crimes and hate incidents cut across race, gender, ethnicity and socio-economic status. He’s asked himself that very same question. Han was born in Laos, number eight in a family of nine children. His oldest brother served as an accountant to the Royal Lao Armed Forces, the official military of the Kingdom of Laos during the North Vietnamese invasion of Laos and the civil war that tore the region apart between 1960 and 1975. Han’s father was a restaurant owner who catered to Western customers. “He knew how to bake baguettes,” he said. When the communists took over in 1975, the fighting began. Han remembers hearing bombs and gunshots. The family went into a neighbor’s basement and hid there for three days. During the war, Han remembers sitting outside his home and corpses float along the Mekong river. He didn’t want to go to school. His oldest brother was taken away to a reeducation camp. Two brothers escaped to France and one other fled to Australia. In February of 1980, Han, 11 at the time, his parents and remaining siblings, escaped Laos in a canoe at night, silently floating down the Mekong. They got to a refugee camp in Thailand. Han was 12 when the family arrived in Oakland. They settled down in one of the poorest neighborhoods in town, a hub of sorts for new refugees and immigrants. He looks back at his fourth grade pictures. He was the only kid in class who wasn’t black. Life was hard, not just because of financial struggles, but other situations Han and his family members weren’t quiet prepared to face. They had run away from bombs and gunshots. But in their Oakland neighborhood, they routinely heard the sound of police choppers and gunshots. Han then experienced hate, for the first time in his young life. 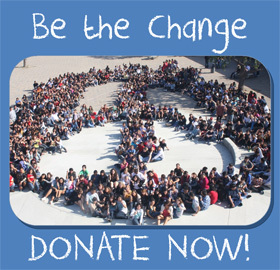 He came to OC Human Relations as an intern in 2001 after getting a degree in sociology from Cal State Fullerton. Over the years, he worked in the organization’s Bridges program to increase respect for diversity in Orange County schools, and served as a mediator for the police-community reconciliation program. Han also became author of the county’s annual hate crime report. His own life experience made him uniquely qualified to respond to hate crimes and incidents. In a sense, he felt like he was home. 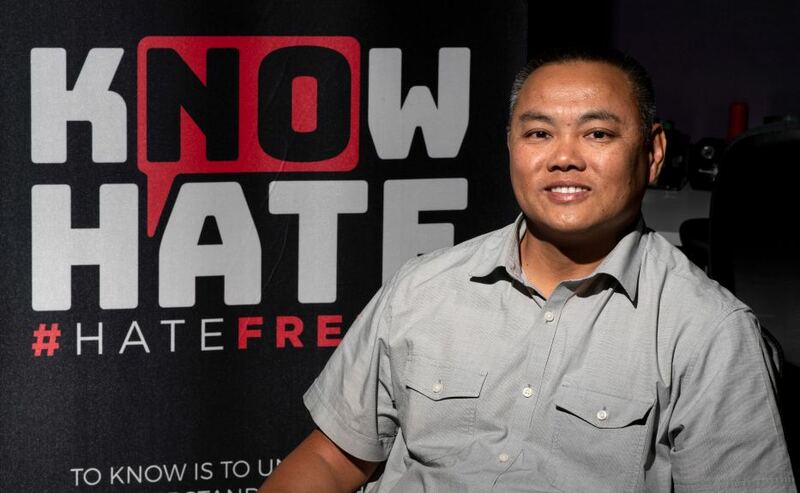 When the LGBT Center OC in Santa Ana received feces in a bubble envelope addressed to the executive director, Han was there to show his support. She said Han has been there for the LGBT community when their building was tagged with slurs, after the shooting at the Pulse nightclub in Orlando and after 19-year-old Blaze Bernstein was stabbed over 20 times and killed by Samuel Woodward who is now facing murder and hate crime charges. Bernstein was both Jewish and openly gay. More than anything else, she said, Han understands what it’s like to be a member of a targeted community. In July Han got a call from a local law enforcement agency about a Muslim woman. Just a few days after she had played Arabic music to celebrate her daughter’s engagement party, in her home she’d lived in for more than two decades, three men pulled up in a car and threatened her. According to hate crime statistics Han compiled, the county has seen increases in hate crimes for three straight years in a row. In 2017, Muslims faced the highest number of hate crimes at 13 percent. Muslims and those of Middle Eastern descent together accounted for 16 percent of hate crime targets in Orange County. Han says his goal is to stop the normalization of hate. He also talks to communities about how they should respond to hate. Cell phone videos have proved to be a great way to expose hate, Han said. “It makes the attacker think twice because there could be evidence,” he said. The biggest challenge for him is when people treat hate as a mere number. With his work, Han hopes he can change that.